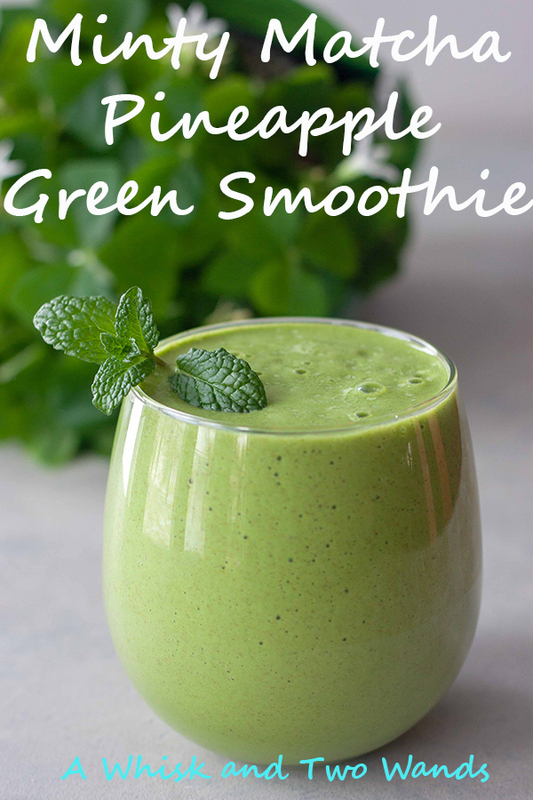 St. Patrick’s Day may have been yesterday but I enjoy this Minty Matcha Pineapple Green Smoothie all year! This simple and refreshing combo is one I’ve been enjoying a lot lately and gives me a little boost since coffee hasn’t been agreeing at the end of the pregnancy just like the beginning. It’s one I like for breakfast or in the afternoon for a quick, delicious, healthy snack. I’m craving all the green juices and smoothies, and still citrus (fruit in general), as I have most of my pregnancy but especially these last couple weeks. Balanced with donuts of course if you’ve seen my social media posts. I haven’t been as hungry and eating smaller meals smoothies and juices have been a go to. Only problem is I don’t have the energy to go buy and clean lots of produce and make my own juice and most of the good ones I want aren’t pasteurized so they’re off limits. Luckily I’ve found a few store bought ones I do like that are organic and flash pasteurized and alternate between those and smoothies like this. Hoping if things go as I hope I’ll be holding Baby Boy when this posts. If not I have an ultrasound today to check on him and discuss next steps for his arrival. As much as I feel I’m not done mentally I am as I’m not able to be as active as I’d like and I’ve been extremely exhausted in the last week and a half. Literally it hit out of no where, working out one day and having no energy and taking naps the next. Matcha is my go to for a boost, and if you’re not a matcha lover and happen to have some sitting around this is a great way to use it up. Paired with pineapple and mint it’s refreshing and you don’t really taste the matcha. Of course my husband thinks I’m immune to tasting thing I love sometimes I don’t think that’s the case with this one. I not only pack in a little natural energy boost but some greens, omegas, fiber, protein, vitamins, minerals, oh and optional additional protein and collagen. A combo that not only tastes good but is good for you. A blend of maple (or sub coconut water) water, pineapple, spinach, match (or use matcha collagen for an extra boost), mint, and chia seeds. If you like it extra cold or want to use fresh pineapple you can also add ice. If you need extra protein you can add in a scoop of unflavored protein. 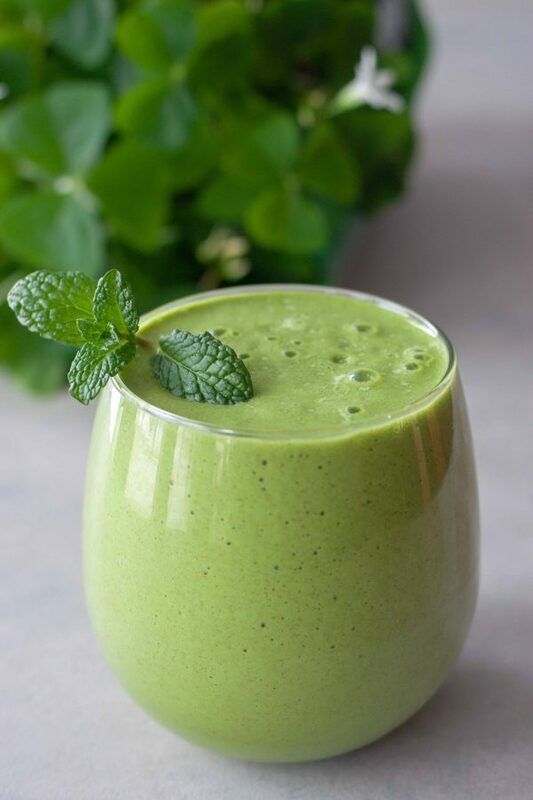 Some of my favorite recipes like this Minty Matcha Pineapple Green Smoothie are so simple it’s hard to put into words how good they are. One of those you just have to try for yourself and if you’re like me you can never have too many green smoothie combos. I honestly usually just figure out what I really need in one, want, and crave and blend it up. Next time you need a boost or are just craving a green smoothie I hope you blend it up and give it a try! Don’t forget it’s Meatless Monday and there are more great recipes linked up below and as always Deborah and I hope you join us and look forward to what’s cooking in your kitchen. 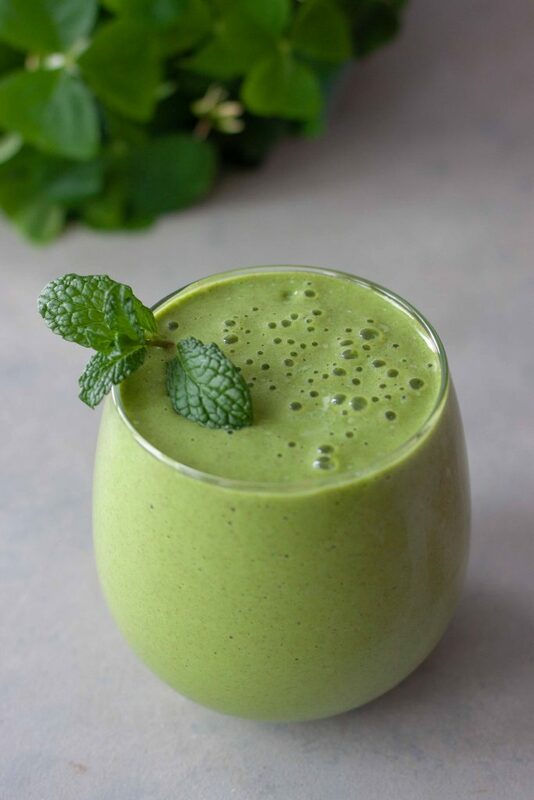 Minty Matcha Pineapple Green Smoothie is a refreshing tropical green smoothie packed with nutrition and a natural boost of energy. 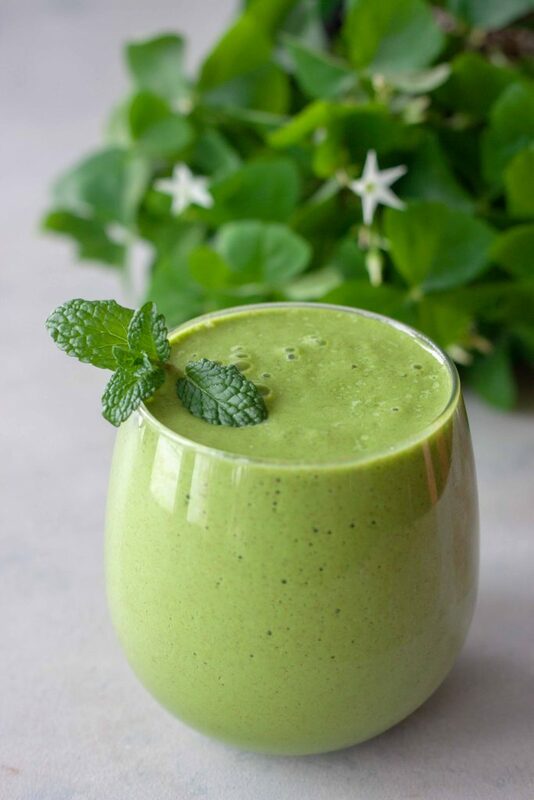 A blend of hydrating maple (or sub coconut) water, pineapple, mint, spinach, and chia seeds. Optional protein and collagen boost options this smoothie is dairy free, gluten free, and vegan. In a Vitamix, or high-speed blender, blend everything together until smooth. If adding a scoop of protein use 12oz of maple/coconut water. Loving all the smoothies lately! I made a shamrock shake last week and man it was tasty, albeit way too cold outside to eat haha. I was freezing after I was done. This sounds delicious, I’m not a matcha fan but that makes sense that the pineapple and mint would cover up the taste a bit 🙂 I hope things went as hoped and congratulations are due! Just wanted to pop over to stay CONGRATULATIONS!!! Too bad we don’t live closer the boys could all be friends! Hope you are feeling ok! That would be fun and we could go on walks together and hangout at the playground.